After the wettest August in Tasmanian history (or so I'd read), I found myself sloshing my way in to visit a few of the nicer waterfalls in the hopes of rescuing an otherwise washed out winter trip. Unfortunately, with parts of the state in flood, the bigger creeks had become thunderous affairs, billowing white water and pushing out a horizontal spray fierce enough to completely drench all who ventured close. 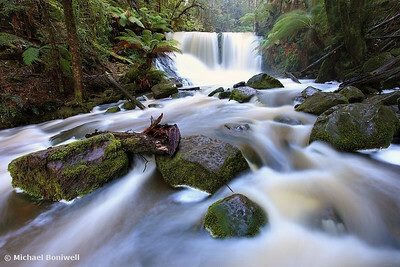 The ever popular Russell Falls for example was out of the question but nearby Horseshoe Falls, normally a polite trickle in summer, was now a spectacular display. Eager to get the best light and the place to myself I approached just after dawn for that soft, glistening glow and walked away excited by this beautifully vibrant scene.